TUNEL Assay Kit - BrdU-Red ab66110 (previously called TUNEL Assay Kit - In situ BrdU-Red DNA Fragmentation) uses a convenient and sensitive method to detect DNA fragmentation by flow cytometry and fluorescence microscopy in live cells. This TUNEL assay protocol uses Br-dUTP (bromolated deoxyuridine triphosphate nucleotide), which can be more readily incorporated into DNA strand breaks by the TdT enzyme than other dUTP labels such as fluorescein, biotin or dioxigenin. 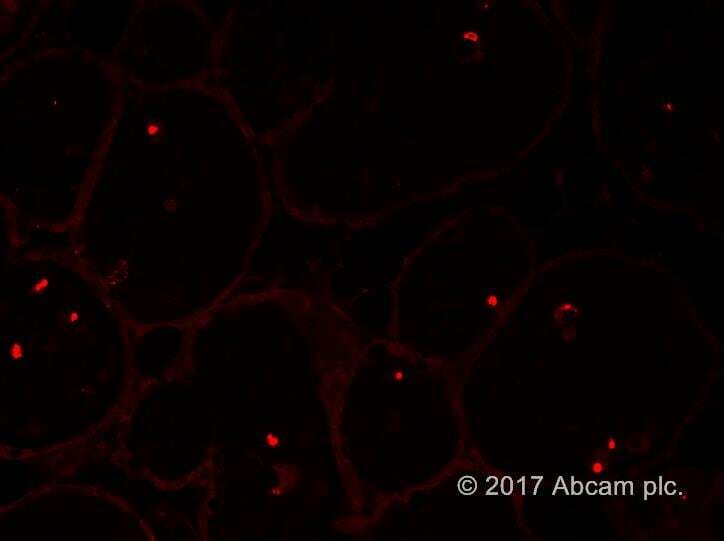 The greater incorporation rate produces a brighter signal when the Br-dUTP sites are detected with an anti-BrdU monoclonal antibody directly labeled with a red fluorochrome. BrdU-Red can be analyzed at Ex/Em 488/576 nm, with an optional 7-AAD counterstain at Ex/Em 488/655nm. The TUNEL assay kit includes both negative and postive control cells. It is designed to be suitable for studying DNA fragmentation in GFP-transfected cells. This kit is BrdU-Red labeled (Ex/Em = 488/576 nm). To use FITC (Ex/Em = 495/519 nm) as a label, we recommend TUNEL Assay Kit - FITC (ab66108). 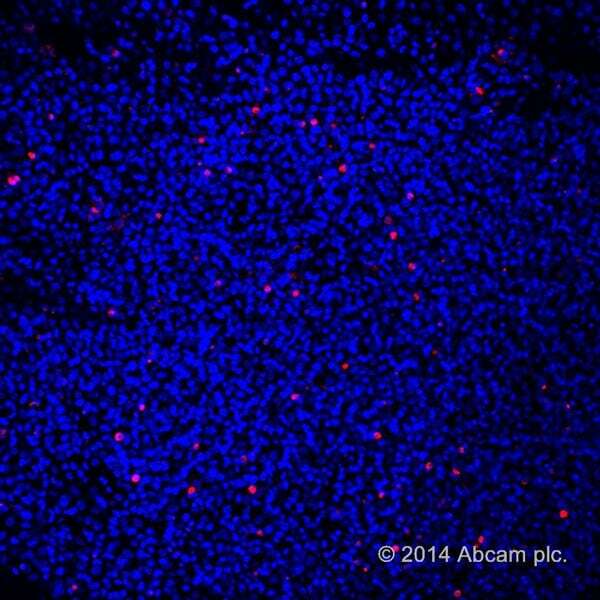 For chromogenic TUNEL staining, we recommend TUNEL Assay Kit - HRP-DAB ab206386. Find out more about the TUNEL method in the TUNEL staining / TUNEL assay guide. Internucleosomal DNA fragmentation is a hallmark of apoptosis in mammalian cells. Immunohistochemistry - ab66110Image from Hopkins J et al., PLoS Genet 10(7), fig 1C. Doi: 10.1371/journal.pgen.1004413. Immunohistochemical analysis of paraffin embedded 5 micron thick testis tissues of 8 week old Stag3+/− and Stag3−/− (Stromal antigen) mice . Apoptotic cells were detected using In situ BrdU-Red DNA Fragmentation (TUNEL) Assay Kit (ab66110). DAPI was used as a counterstain. Detection of DNA fragmention (TUNEL staining) using the negative and positive control cells (HL-60 untreated and treated with camptothecin). Cells were stained following the assay protocol. The fluorescence signal was detected and analyzed using BD FACScan System (Becton Dickinson). TUNEL staining in whole mount Hydractinia echinata using In situ BrdU-Red DNA Fragmentation (TUNEL) Assay Kit (ab66110). Animals were fixed in 4% PFA in PBS for 1 hour and processed as per the protocol without proteinaseK treatment. In place of proteinaseK animals were permeabilised in 3% Triton in PBS for 15 minutes. Animals were counter-stained with DAPI. Publishing research using ab66110? Please let us know so that we can cite the reference in this datasheet. Worked very well on mouse Lewis Lung Carcinoma cells grown in vitro. This kit is very good when I used on human tumor sections. Just follow the manual and you will get good results. 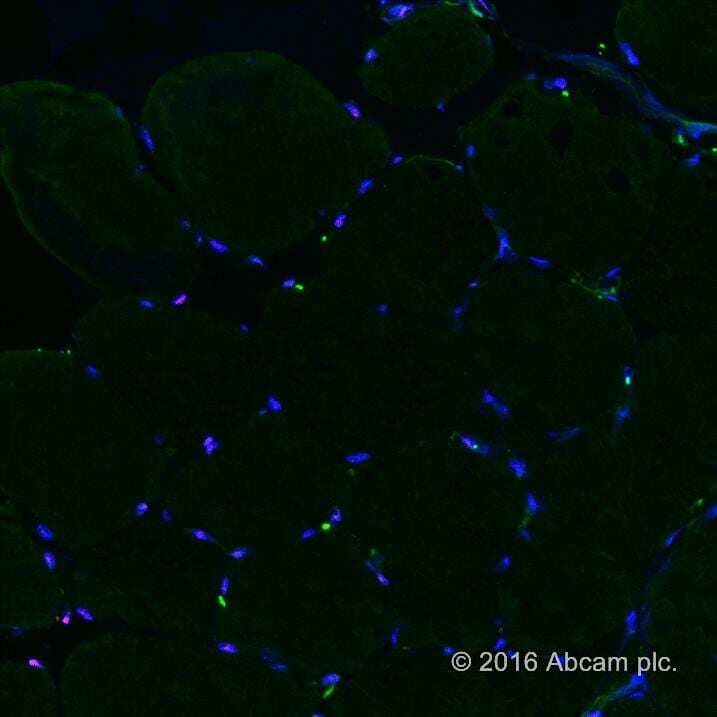 Also, if you want do double fluorescent staining for other antigen, you can use heat induced antigen retrieve too. It works on quail tissue. It is a long procedure, it fades relatively fast. I purchased this kit with the purpose of staining cultured cells. It totally failed in that purpose and I would recommend the xxxx kit if your aim is to investigate apoptosis in cultured cells. The protocol provided by Abcam does not mention any suggestion for cultured cells. Additionally, the protocol is not well written. This includes a mistake on the manual with a recommended amount to pipette. You will easily find the mistake but this should not happen. I sent an email to Abcam and I hope they correct the mistake. Frozen sections of snap frozen sekeletal muscle tissue with isopentane were used in the application. Sections were fixed in cold acetone for 10 minutes and then treated with 5% normal goat serum as a blocking reagent for 30 minutes. *PBS was used for rinsing/washing solution in between steps. Sections were coverslipped using fluoromount mountant and kept refridgerated at 4C in the dark until ready for visualisation. Can this kit be combined with normal immunostaining and if yes should it be done before or after it? We have not done any additional antibody staining with the ab66110 In situ BrdU-Red DNA Fragmentation (TUNEL) Assay Kit .Whether it can be done will depend on the criteria required by the additional antibody but theoretically staining should work after the ApoBrdU labeling. Animals were fixed in 4% PFA in PBS from 1 hour and processed as per the protocol without proteinaseK treatment. In place of proteinaseK animals were permeabilised in 3%Triton in PBS for 15 minutes. Animals were counter-stained with DAPI. I have some questions about In situ BrdU-Red DNA Fragmentation (TUNEL) Assay Kit (ab66110). I want to detect DNA strand brakes in GFP-positive cells using this kit, and I want to observe BrdU-positive signals with FACS analysis. Which channel should I use for detection of "Red" signals (PE or something?)? I also want to learn how to avoid spillover between channels. It is likely that GFP spills into the Red (PE?) channel. 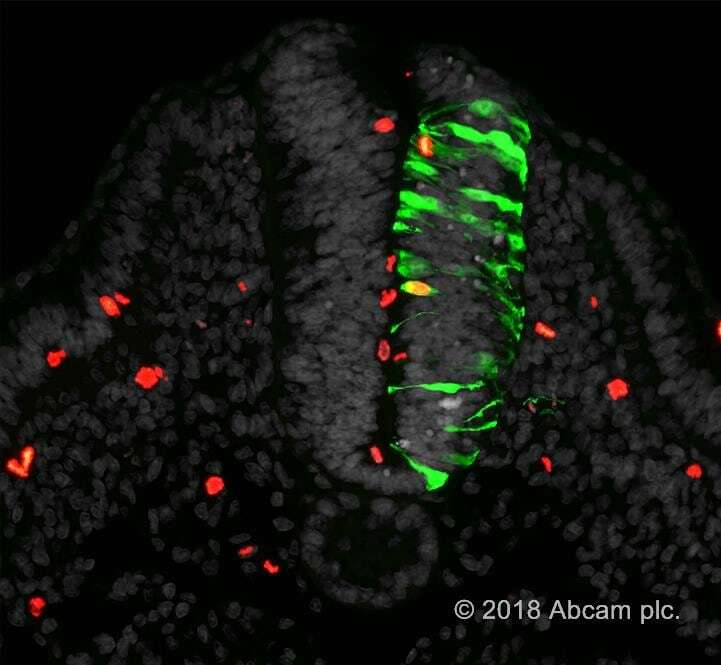 I want to know how to compensate Red signals in GFP-positive cells. 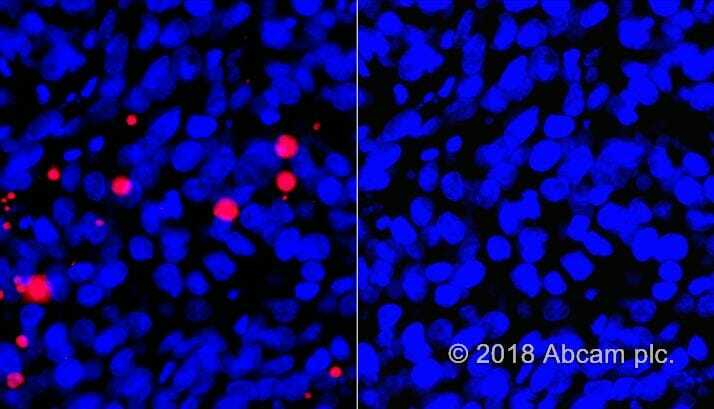 Or to avoid spillover, can I use anti-BrdU antibody-Alexa647 (ab171060) combined with this TUNEL assay kit to detect BrdU instead of anti-BrdU-Red? This kit is specifically designed for and has been used for co detection of GFP transfected cells and the Red fluorescence labeled anti-BrdU monoclonal antibody. There is therefore no need to use this other antibody conjugated to AlexaFluor647. 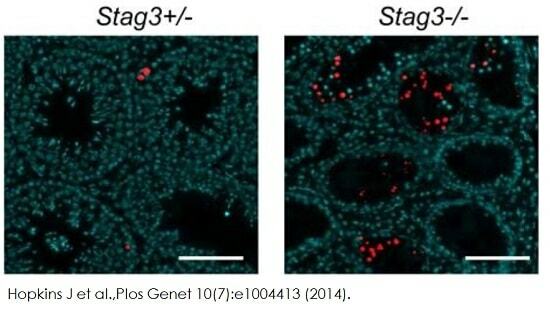 - Kikuchi, J.. et al.Histone Deacetylases Are Critical targets of Bortezomib-Induced Cytotoxicity in Multiple Myeloma. Blood, 2010; 116: 406-417. - Sheu JJ-C et al (2008) Cancer Res. 68: 4050 - 4057. The 7AAD stain has different excitation and emission maxima than the Red fluorescence from the antibody ( emission max is 576 versus 655nm). This difference is enough to distinguish spectrally the signal from the antibody and 7AAD. 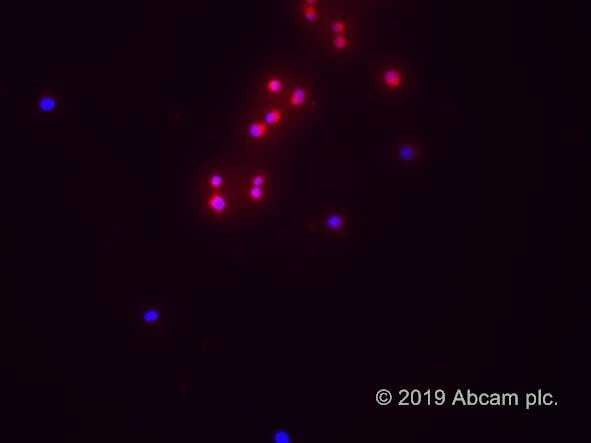 The main reason for selection of 7-AAD is that conventional bench-top analyzers utilize a 488-nm laser line, which can excite DNA stains such as 7-amino-actinomycin D (7-AAD) but not DAPI. The availability of an ultraviolet (UV) laser line to excite DAPI is not commonly available on the same instrument in labs. This is why 7-AAD has greater flexibility and ease of use. Flow cytometry offers a more definitive and quantitative way to look at the cells in comparison to microscopy. As stated on page 11 of the protocol booklet, the quantification by flow cytometry protocol can be used for your test cells and the control cells. Part 2 of the protocol is the same for control cells as well. You need to carry out step 2i and then only the control cells are labelled with the antibody for visualization. To use microscopy, simply follow this protocol until you reach part 2l and rather than analysing on a flow cytometer, cells can be aliquoted onto a glass slide, covered with a coverslip and observed under a fluorescence microscope. There is no complicated protocol steps to provide. Typically 50 ul cells should be enough to be put on the slide. The correct excitation/emission filters need to be used for visualization. The positive control cells have been induced to initiate DNA fragmentation and hence should show higher Brd-UTP labeling. 1. For adherent cell line systems, the cells in the supernatant have a higher probability of being apoptotic than do the adherent cells. Save cells in the supernatant for assay prior to trypsinization of the adherent cell layer. 2. Cell fixation using a DNA crossing linking chemical fixative is an important step in analyzing apoptosis. Unfixed cells may lose smaller fragments of DNA that are not chemically fixed in place inside the cell during washing steps. The researcher may have to explore alternative fixation and permeablization methods to fully exploit their systems. 3. To minimize cell loss during the assay, restrict the assay to the use of a single 12 X 75 mm test tube. If polystyrene plastic test tubes are used, an electrostatic charge can build up on the sides of the tube. Cells will adhere to the side of the tube and the sequential use of multiple tubes can result in significant cell loss during the assay. 4. Occasionally a mirror image population of cells at lower intensity is observed in the flow cytometry dual parameter display. This population arises because during the 50 μl DNA Labeling Reaction some cells have become stuck to the side of the test tube and are not fully exposed to the reaction solution. This phenomenon can be overcome by washing all the cells from side of the tube and making sure all cells are properly suspended at the beginning of the labeling reaction.